Hi foodies...Welcome to AYESHA'S KITCHEN. 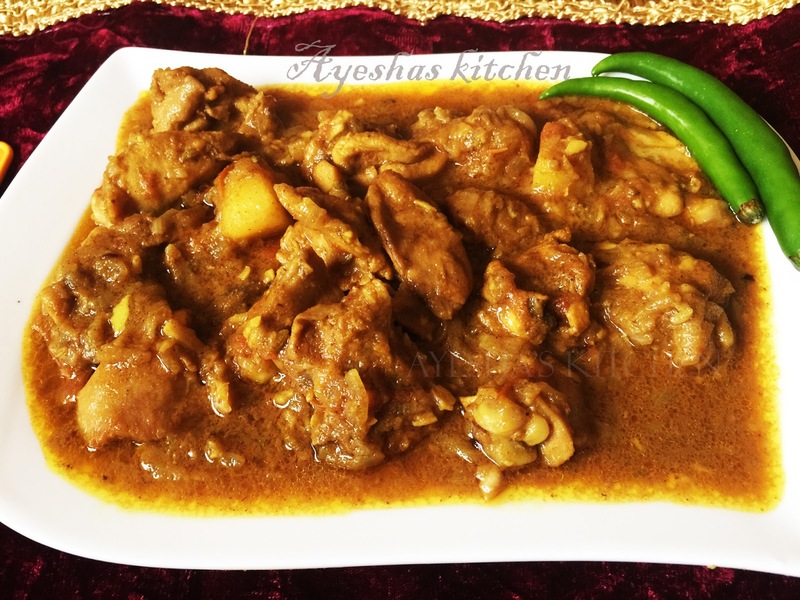 Today am going to share an Indian chicken curry recipe. This is mainly a south Indian dish, locally it is called Chicken mulakittath. Heat oil in a vessel and put green chilies and saute for a while. When a nice aroma comes, put sliced onion and saute until golden. Now add chopped tomato and required salt. Close the lid and cook for few minutes. Now add ginger, garlic and fennel seed paste.Saute well. Add the chicken pieces and cubed potatoes together. Mix well. Now add turmeric powder, chili powder, coriander powder and finally garam masala powder.Mix well. Add required salt and put coriander leaves. Let the chicken and the masala cooks well . So do not add water now. After few minutes add half cup of hot water if required. Cook it, until the oil separates. Fry the finely chopped small onions and curry leaves. When done pour it over the curry.